The quarter of the audience at the Sony Centre last night that weren't present for opener Nilüfer Yanya's set (probably due to Toronto's torrential downpour) missed a diamond in the rough. In the 22-year-old's first Toronto outing, she started with tracks from her 2017 release Plant Feed, including the post-punk, jazz-reminiscent "Golden Cage." However, the songs from her debut EP Do You Like Pain? were Nilüfer's shining moments, as her soulful lyrics about getting out of a bad relationship fused with her seemingly bottomless groove-laden voice. A striking combination of a jazz-infused Marina and the Diamonds and a more pop-leaning Imogen Heap, Nilüfer's voice haunted on tracks like "Baby Luv" and "Thanks 4 Nothing." That said, her stage presence has room to grow. She exchanged only small pleasantries with the crowd between songs, never giving a real chance to get to know the artist beneath the funky jazz voice. The silent progressions between songs and the lack of audience interaction showed the London-based singer's age. Still, the crowd was left wanting more — a rousing endorsement for someone opening for an act as grand as Fleet Foxes. The headliners sauntered on stage and opened their set with a strong surge of instrumentation and visuals, then proceeded to play songs like "Grown Ocean," "Thumbprint Scar" and "Cassius," with no pause in between. Robin Pecknold bopped along between each instrument switchover, never losing rhythm or fluidity during the first 15 minutes of the set. The lead singer told the Sony Centre audience how the band felt lucky and proud to be in a city like Toronto, even though they were last here a year ago. "It hasn't been a long time, but any amount of time is too long," he said before the group segued into "Ragged Wood," "Your Protector" and the more boppy "Fool's Errand." Throughout the set, the band's instrumentation was jaw-dropping. 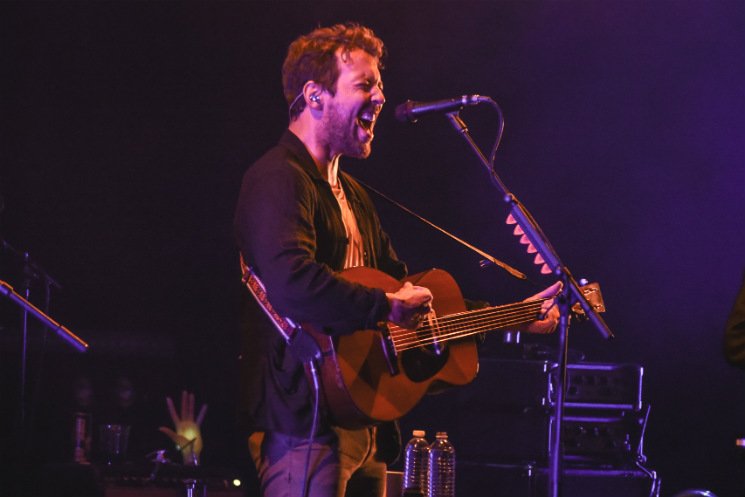 Fleet Foxes' trademark flawless harmonies were kept intact as the group moved smoothly from sombre to soaring songs. Much like their Crack-Up album cover, what the band does best is create music that crashes on the listener like waves, mounting the shore before subsiding. A highlight for the West coast folk rock band's skills and abilities was the performance of "The Shrine / An Argument," in which Skyler Skjelset shredded his guitar and Morgan Henderson slayed the eerie saxophone solo like he was producing the score of a Black Mirror episode. The spiffy hour-and-a-half set was finished with the nature-recalling rhythms of "Blue Ridge Mountains," before Fleet Foxes came back out for an encore. The goosebumps-inducing "Helplessness Blues" was a crowd favourite, the only song everyone sang along to, and an excellent final song choice to make people glad they came out despite the rain.